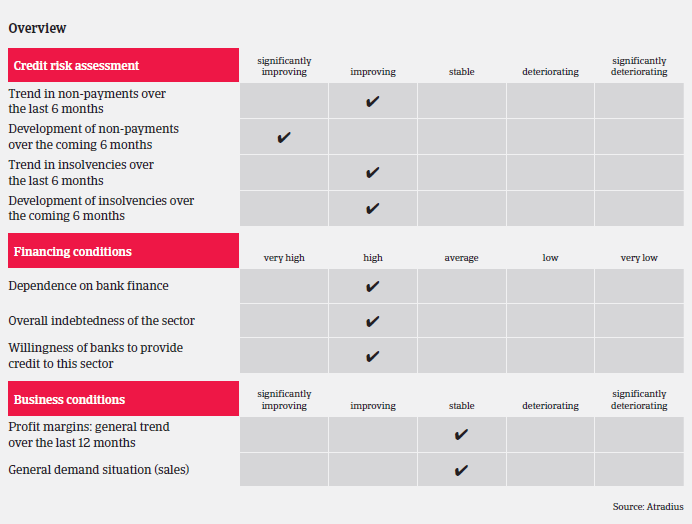 Insolvencies are expected to decline further, but at a slower pace than in 2015. 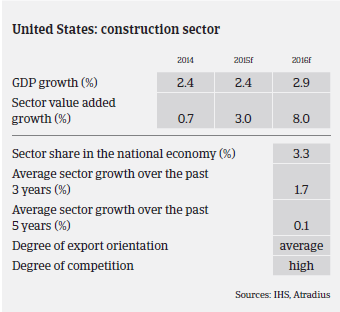 In 2015 the US construction sector continued its rebound that started in 2012, with increases in both employment and reported billings, and there is a sense of optimism among construction industry executives that growth will continue for the foreseeable future. The Wells Fargo Equipment Finance´s Construction Optimism Quotient among US contractors and equipment distributors reached new highs in three of the last four years, culminating in a record high for 2015. Residential construction is estimated to have grown 8% in 2015 and is expected to remain robust through 2019. Foreclosures have decreased 19% over the past 12 months, with foreclosure filings in August 2015 on just 1 in 1,205 houses. Non-residential construction had its second best year since 2002, with reported spending increased by more than 8% year-on-year. The US construction equipment market saw improvements in 2014 and 2015, and expectations remain strong for equipment rental. Construction industry unemployment rates further declined, narrowing the gap between it and the national unemployment rate. According to the US Bureau of Labor Statistics, the unemployment rate in the construction sector declined from 8.3% in December 2014 to 7.3% in December 2015. Unemployment rates in the construction industry are at the lowest levels since 2007. In 2016 construction production is expected to grow further, as US economic growth is forecast to increase 2.9%, driven by robust private consumption expansion and rising investment. Construction output is expected to grow around 5% in 2016 and 2017 respectively. 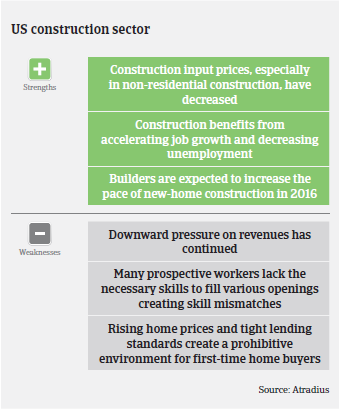 Accelerating job growth and decreasing unemployment, increasing new-home construction, and lower construction input prices have all increased the likelihood of construction projects advancing. Banks are principally willing to lend to the construction industry, but only for viable and promising projects. As the commercial and residential development markets strengthen, the construction sector´s financing climate is improving. Payments in the US construction industry still take 30-60 days on average, while 90 day terms are not uncommon. The overall number and the value of late payment notifications we received in 2015 has decreased, as did insolvencies. Given the positive growth prospects for the industry, we expect notifications of late payments to decrease further in H1 of 2016. In line with the overall trend in the US, construction insolvencies are also expected to decline further, but at a slower pace than in 2015. Small businesses in the industry are generally still paying later and have higher bankruptcy rates and delinquent debt than other industries. At the same time increasing salaries, healthcare costs for staff and miscellaneous expenses continue to affect margins. While foreclosure rates have decreased in general, states such as Maryland, Florida, New Jersey, and Nevada still record high delinquency rates. At the same time, building segments dependent on the energy sector continue to suffer from sharply decreased investments. Due to the positive development, we have steadily increased our risk appetite for the industry over the past few years. But given the problems mentioned above caution is still advised, especially with smaller construction businesses. When available, financial statements are to be reviewed annually with supplemental soft credit information reviewed more frequently. Trading experience will be used to gain a better comfort level in gauging the relationship between our customers and their buyers. Reduction or withdrawal of cover is considered if the buyer shows significantly worsening results, including losses, heavy debt levels, problems with working capital, cash flow or liquidity or deteriorating payment trends. We look for signs of progressive and profitable operations, positive working capital and cash flow, and satisfactory debt to net worth leverage. We also take into account less measureable aspects such as goodwill, health/pension liabilities, and litigation issues. The first increase in US interest rates in almost 10 years may lead to trouble in emerging markets. In 2014 and 2015 growth is expected to return in the US steel sector, with apparent steel use expected to increase 4% in 2014 and 3.7% in 2015.